Action Figure Barbecue: Episode #36 of the Confirmed Epic Podcast: We Review Marvel's Star Wars #2, talk about Ghostbusters 3, and more! Episode #36 of the Confirmed Epic Podcast: We Review Marvel's Star Wars #2, talk about Ghostbusters 3, and more! This past weekend I recorded another episode of the Confirmed Epic Podcast with my besties over at ThEpic Review! 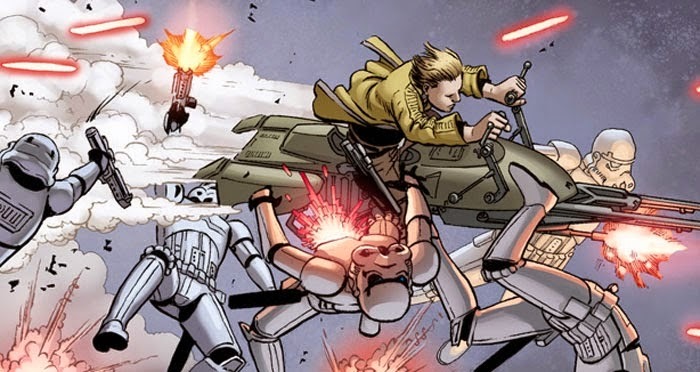 We did another Star Wars comic review for Episode 36 of the Confirmed Epic Podcast because we couldn't figure out what movie we all wanted to see. Join me, Barbecue17, the Reel Brad Bell, and Andrew Stokes as we talk about Marvel’s Star Wars #2 by Jason Aaron. I even do a dramatic reading of a few parts and play the Star Wars theme on my harmonica. It's great! We also discussed: Ghostbusters 3, managing Star Wars: The Force Awakens expectations and a potential release push, Netflix’s new DareDevil Trailer, Netflix’s potential live-action Zelda show, David Fincher’s Gone Girl, Star War: Tarkin by James Luceno, Loot Crate, and Hulks Agent of Smash on Netflix. We also delve into overarching conversations about Comic/Film continuity and race/Gender in the modern Comic Book. It's always good to hang out with these guys and talk. Hopefully you'll enjoy it too! Check it out over at ThEpic Review! It's always fun to hang out with those guys and talk about everything and nothing!